Lily fox created an unintentional mash-up that will take you from Hyrule to infinity and beyond. Buzz Light Year as Link in the Legend of Zelda. 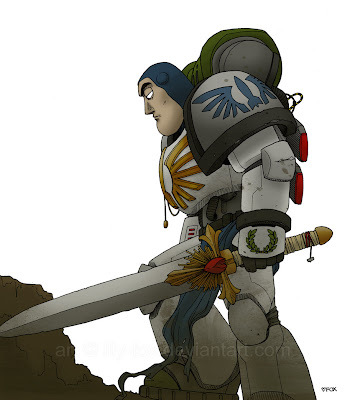 I don't believe this is what Lily intended, she was going for Buzz as a Space Marine. Regardless, Gfest loves Lily's work, and I have to say Buzz would make playing Zelda a hell of lot easier. I can sense Gannon and Zurg shaking in their boots. This has zip to do with Zelda. The zelda connection is flimsy. Maybe the sword is the connection but since those are common among space marines, i don't see it. Also, that is not terminator armor, it has a back back and the pauldrons are too low, they should offer more head protection if they are termy armor.